Hope you had a fantastic start of the year 2019! We love reading! And hope you too 🙂 So, how many books you’ve read in this year so far? And, which of them you liked the most? 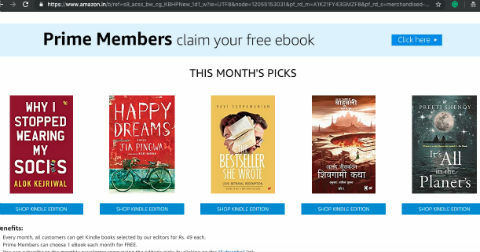 Here is the list of the 5 books from which you can pick one absolutely Free (Kindle EBook). Which one of these books excites you more? In case if you want a paperback copy of any of these books, Amazon offers that as well, at a special rate. I recommend you to read all the details on the Amazon’s offer page thoroughly (including terms and conditions) before going for the same. I did claim my free benefits as Amazon prime member and hope you too. What do you think about this program? I recommend going for it if you an Amazon prime member for sure? Also, let us know your comments for this article and feel free to let us know if you would like to see more such articles in coming days.